Bobby Womack, a colorful and highly influential R&B singer-songwriter who influenced artists from the Rolling Stones to Damon Albarn, has died. He was 70. 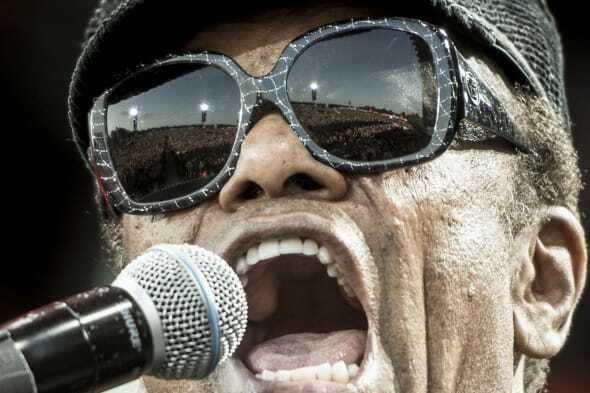 Womack's publicist Sonya Kolowrat said Friday that the singer had died, but she could provide no other details. With an incomparable voice few could match, Womack was a stirring singer and guitarist in his own right and a powerful songwriter whose hits like "Across 110th Street," ''If You Think You're Lonely Now" and "I Wish He Didn't Trust Me So Much" captured the imagination of future stars in rock 'n' roll and R&B. "He had a style that nobody else could ever capture," longtime friend, gospel singer Candi Staton, said in a statement. "I loved him and I will miss him so, so very much." Womack's death comes as something of a surprise. Though he was diagnosed with Alzheimer's disease two years ago and overcame addiction and multiple health issues, including prostate and colon cancer, recently, he seemed in good health and spirits when he performed earlier this month at the Bonnaroo Music & Arts Festival. He told the BBC in 2013 the Alzheimer's diagnosis came after he began having difficulty remembering his songs and the names of people he had worked with. And there have been many. The soul singer cut a wide path through the music business as a performer and songwriter in a career that spanned seven decades. Womack was inducted into the Rock and Roll Hall of Fame in 2009, long after he'd lost his fortune and his career to addiction. He spoke of kicking his substance abuse problems in a 2012 interview with The Associated Press and all the friends he'd lost to drugs over the years. "I think the biggest move for me was to get away from the drug scene," Womack said. "It wasn't easy. It was hard because everybody I knew did drugs. ... They didn't know when to turn it off. So for me looking at Wilson Pickett, close friends of mine, Sly Stone, Jim Hendrix, Janis Joplin, and I can go on and on and on, and I say all of them died because of drugs." According to the Rock and Roll Hall of Fame website, Womack was born in Cleveland, Ohio, and sang gospel music at a young age, performing with his brothers in The Womack Brothers. Under the influence of gospel and R&B legend Sam Cooke, who signed the group to his personal label, Womack moved into secular music. In the early 1960s his group recorded "It's All Over Now," which was covered and by the Stones and became the band's first number-one hit. His songs have been recorded by multiple artists, and he played as a session musician in Memphis in the 1960s. Albarn and XL Recordings president Richard Russell helped Womack regain his career with 2012 comeback album "The Bravest Man in the Universe." The album was a departure for Womack, full of electronic music and beats. But it was lauded by critics for a simple reason: That distinctive voice of his still brought chills. "I don't think he ever really thought that he would do anything again," Albarn said of Womack in March. "Watching his rehabilitation and watching his ability to confront new material and new challenges was nothing short of miraculous at the time, and he still today continues to battle his demons and his illness. But he's a beautiful person and when he opens his mouth and that voice comes out, it is something that is somehow touched by God." AP Music Writer Mesfin Fekadu in New York and Don Schanche contributed to this report.